Gather your friends, pull up a chair, dig in, and mop up the to-die-for pan juices from these Gin-Gingered Prawns. Ready in 5 minutes. Really! 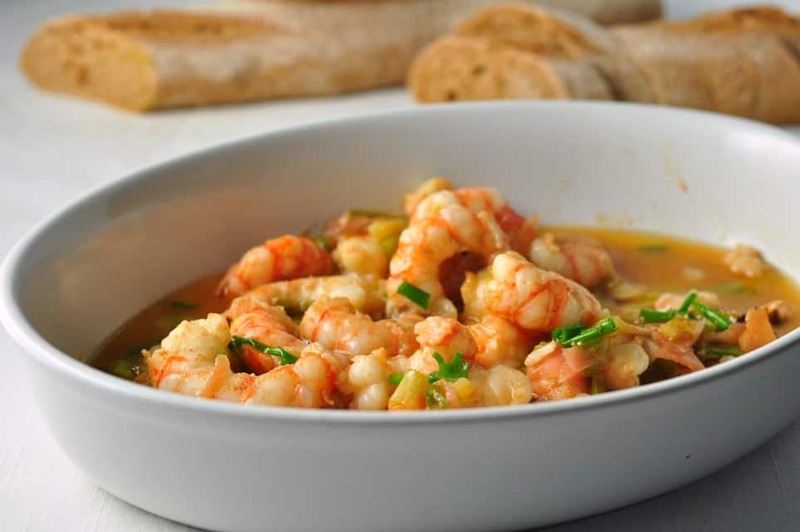 Once you make these Gin-Gingered Prawns, they’re bound to become a favourite appetizer! 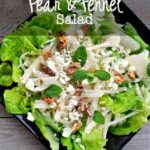 Not only because they’re succulent and almost sweet, but because this recipe makes the easiest appetizer ever! It’s almost prawn season on the West Coast and these big succulent beauties will be available soon. 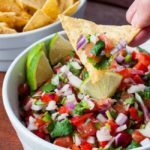 Prawns are such a versatile shellfish and they make show-stopper appetizers like this chili lime shrimp, but this easy dish is one of our favourites. 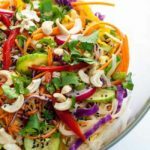 It’s ready in 5 minutes. Really! While fresh prawns are always best, large wild-caught frozen shrimp will also work beautifully in this appetizer recipe. Check to make sure the shrimp you buy are wild-caught and “ocean-wise” indicating that they have been sustainably harvested. Farmed shrimp have very little flavour. 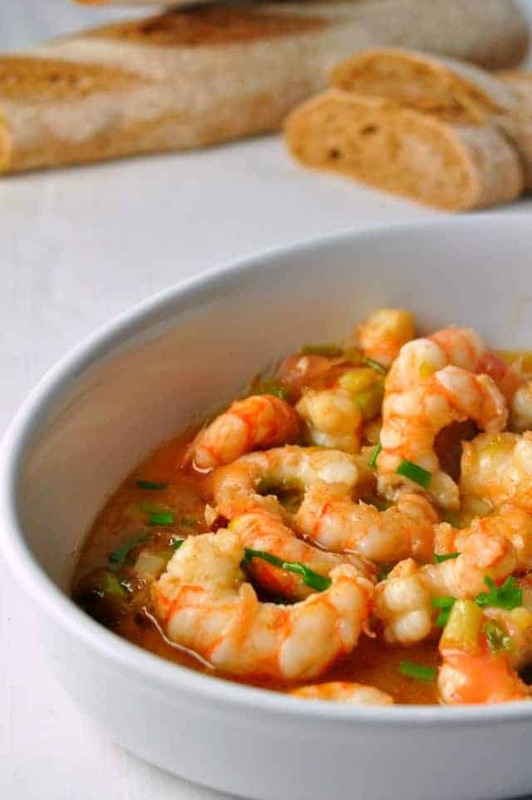 This recipe for Gin-Gingered Prawns has stood the test of time. 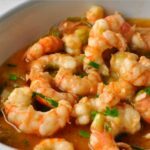 This Gin-Gingered Prawns recipe appeared in a cookbook by Diane Clement in the 1980’s and it’s a classic that shrimp-lovers never tire of. 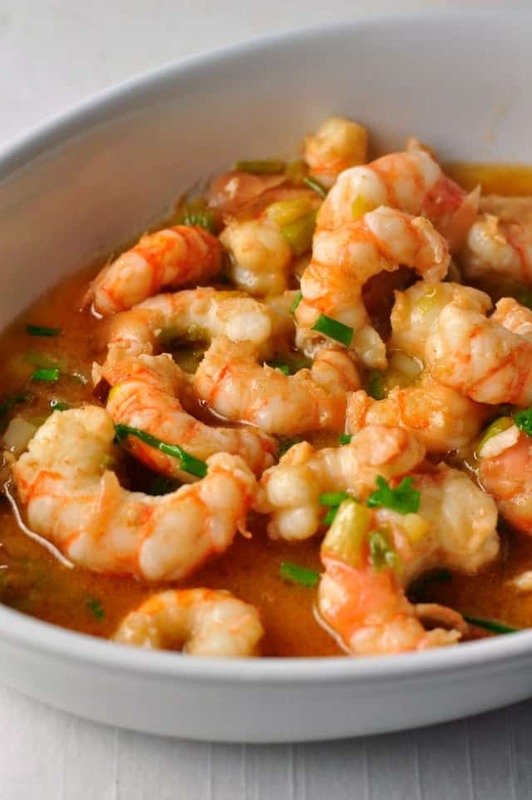 To make this prawn or shrimp appetizer, simply melt a little butter in a skillet, add some chopped green onions, toss in the shelled prawns, some pickled ginger and a generous splash or two . . . or three . . . of gin. Keep it casual! Gather some friends around the skillet and serve with a loaf of crusty bread for dipping. 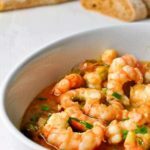 Use prawns or wild-caught shrimp that are available where you live and make these Gin-Gingered Prawns. 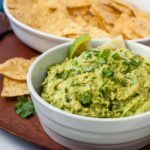 It’s an easy appetizer you won’t easily forget! And if you love grilled shrimp or prawns, you’ll love this recipe for 10-Minute Grilled Chimichurri Shrimp Skewers. 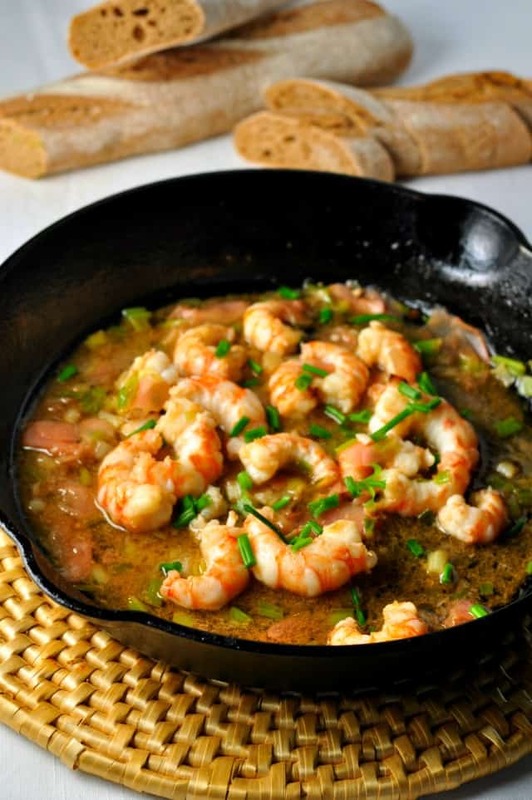 Serve these fresh Gin-Gingered Prawns with plenty of fresh crusty bread to mop up the to-die-for pan juices! 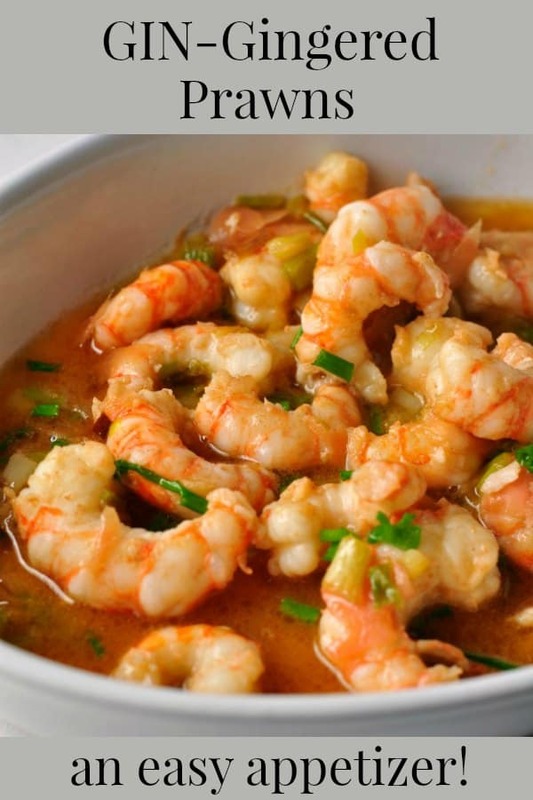 Remove the shells from the prawns and set aside. This task is much easier when the prawns are slightly frozen. Melt butter in a skillet over low heat. Add the chopped green onions and stir for a minute until slightly softened. Add the prawns. Cook for 2 minutes or until just translucent. Add the chopped pickled ginger, a little of the ginger juice from the jar, and the gin. Cook for one more minute. Serve immediately with a crusty baguette for dipping. Mmmmm. Are spot prawns available now??? Recreational fishing only for now. The commercial fishery usually begins around May 1 in this area. However, Cowichan Bay Seafood has frozen spot prawns. We made the gin ginger prawns last night. They were fantastic! You are right, mop up every bit of the juice, yummy! It’s an appy that sometimes turns into a meal in our house! So good.